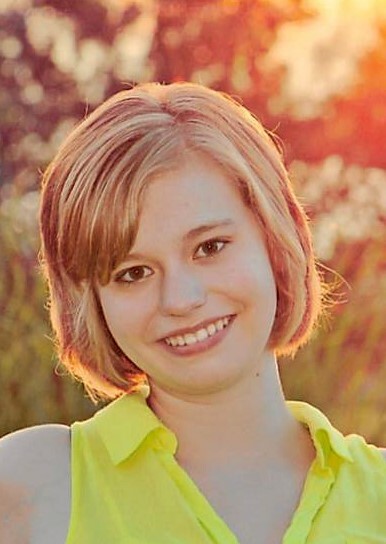 Paige Nicole Griffin of Middlebury Center, PA died at home on Saturday, November 24, 2018. She was 22 years old. Paige was born on September 30, 1996 to Chad and Michele Griffin. She was an exceptional young woman who valued her loved ones and community. Paige was an accomplished artist, a talented violinist, an expert ice cream scooper, and a dedicated Girl Scout. She loved to write stories of adventures almost as much as she loved to have them. Paige was determined to live her life with as much authenticity and joy as possible and in that, she succeeded. Throughout her cancer diagnosis, she remained the ray of sunshine, she always was, and handled each obstacle with quiet grace and humility. Paige had many things she wanted to do in this life, from learning to throw knives to changing the world. Paige certainly changed the worlds of her loved ones—anyone who met her knew she was someone special. Paige is survived by her parents Chad and Michele Griffin of Middlebury Center; her paternal grandfather Darryel Griffin of Little Marsh; her maternal grandfather John “Skip” Fisher of Bloomsburg; her sister Camilla Sossi of Trieste, Italy; her aunts and uncles Penny and Frank Button of Middlebury Center; and Nikki and Karl Schauer of Little Marsh; her cousins Brayden and Tanner Button and Courtney and Kayla Schauer, as well as her ‘fur siblings’ Monroe, Mara, Zoey, and Willow. Paige is predeceased by her paternal grandmother Sharon Griffin (8/14/2016) and her maternal grandmother Jacqueline Fisher (6/13/2016). A receiving of family and friends will be from 12-4:00 pm, Sunday, December 2, 2018 in the Family Life Center at Trinity Lutheran School, 53 West Ave., Wellsboro, PA. A memorial service will follow at 4:00 pm with Rev. Fred Poeppel, officiating. The service will be casual and per Paige’s request, please come in colorful attire. In lieu of flowers, Paige has chosen the following organizations to which donations can be made: CALLIE CARES, 1770 MCCONNELL DRIVE, WILLIAMSPORT, PA 17701 or ALEX’S LEMONADE STAND, 111 PRESIDENTIAL BLVD., SUITE 203, BALA CYNWYD, PA 19004 or HOPE LODGE HOSPITALITY HOUSE, 1120 GOODMAN STREET SOUTH, ROCHESTER, NY 14620.